With a comprehensive range of mats for specialised applications, we offer a service that completely floors the competition. We rent and sell dust control mats for all types of entrances. We vary color on our weekly or bi- monthly applications. 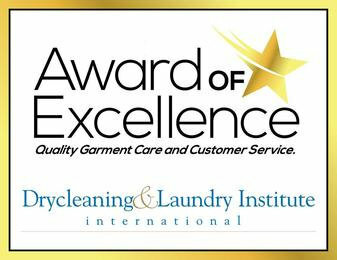 Each mat placed is a fresh laundered mat which compliments the decor in the environment. Our route provides this service within a 50 mile radius of Mt. Pleasant, we also have a complete line, of mops, dust cloths, restaurant cloths, linens, roll up towels and lavatory soap and air freshener services. Our commercial accounts can take care of all of your safety and cleaning needs. Call us for quotes, which are extremely competitive. From static dissipation... to corporate greetings... to anti-fatigue matting, we offer you the finest mats available today - for years of beautiful wear. It's a reputation you can stand on, from Mountville Mills Inc.
As a small locally owned company with over 47 years of service, we've designed our mat program to help us create partnerships with each business. We stay close to your business so we can spot and correct problems quickly. Each rental program is flexible enough to allow custom tailoring to fit your rental needs. Complete mat protection at your facility should include mats at the front entrance, near high traffic areas like vending machines, near static-sensitive electronics like copier, and computers, and in kitchens or wet-floor areas. Our Goal is to provide you with exceptional service and the highest quality commercial and promotional matting products available any where and, of course on world wide web. Manufactured and maintained using the highest quality standards, the famous Mountville mat from Iris City Cleaner protect you in many ways. A mat for every business. Floor mats can be effectively used in many areas and businesses. All from and rear entrances and exit doors,checkout counters, vending machines, time clock, water fountains, deli's, rest room and in businesses like medical clinics, supermarkets and discount stores, schools, colleges and universities, office building lobbies, foyers and hallways, hotels,motels and resort, convenience stores, locker rooms, factories, gymnasiums, home offices and at the entrance and exits of private residences. - Our matting prevents slips and falls caused by rain or snow tracked into your place of business. A mat rental program safeguards your employees, your customers and your company's liability. These features alone could more than justify your investment in our entry mat program. - Did you know that 85% of a dirt and dust is tracked through the front door of your establishment? 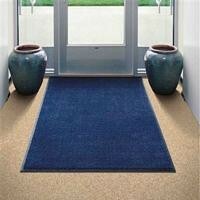 An entrance mat of the correct size gives you a cost - effective way to stop it. Our mats trap dirt and dust at the source saving your company cleaning costs and protecting your carpet and flooring. Every washing contains a powerful sanitizing component to help reduce the amount of germs in the environment. - Our mat program features anti-fatigue properties, making them comfortable and less tiring than floor standing alone. Employees feel better when they work on these supportive mats - increasing productivity and eventual sales. - Believe it or not, the friction that occurs when shoes meet carpet is enough to create static volts sufficient to damage sensitive electrical equipment, and create safety hazards. Our static dissipating floor coverings contain filaments that allow our mats to absorb the static charges. These mats also have "memory", so each washing restores them to their ideal condition. Logo Mats Protect your Floors and your Hard Earned Image right on top of it. The old saying is true. first impressions are important. Current research indicates that most shoppers make an image of the entrance of grocery stores and assume the degree of cleanliness from the first impression, or impression of the entrance as they enter. 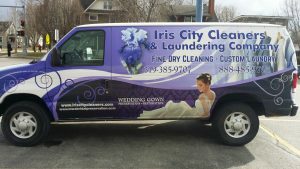 You can create positive and lasting impressions while at the same time, enhancing the safety of your customers and employees through the use of Iris City Cleaners personalized protective floor covering. The first set of logo mats adds a subtle air of quality and sophistication to your company. while saving your flooring investment by keeping water, dust and dirt from entering your place of business. Let our Mat Service Program help you create your own custom logo mats. Our link with Mountville Mills allows you to search over 50000 already created custom logo mats. If you find any suitable or find parts of any you want to use be sure to write down the identifying information and send it to us on our Contact Us frame so we may begin to create for you a no cost computer generated image of what your custom logo mat might look like. MANY OF OUR CUSTOMER HAVE FOUND THAT UTILIZING LOGO MATS HELP PROMOTE NAME RECOGNITION AND BRAND IDENTITY, in places such as entrances, counters, workstations, sales displays and trade show exhibits. Call us today to obtain a rental or purchase program designed to your businesses expressed needs. In our society with it increasing litigious activity, floor mats have proven themselves indispensable in minimizing slips and falls where ever the public and slick floor meet. Many hard surface floors are not slip-resistant, particularly when contaminated with dirt, sand or moisture. Floor mats not only collect these containment's but also provide a slip resistant surface than can help meet American With Disabilities Requirements for providing a safe environment. Your employees will feel better when they work for long periods anti-fatigue floor coverings feature special anti-fatigue properties, making them comfortable and a less tiring surface than most floors. They also add a significant safety factor with not-slip surfaces and rubberized backing. Your employees will feel better when they work for long periods of time on these supportive mats - increasing your company's staff productivity. Call or email us today to obtain a rental or purchase program designed to our businesses exact situation. Concern for indoor air quality and the need for germ control are important building issues today. According to the Center for Disease Control in Atlanta, Georgia, an average person encounters nearly 1,000,000 varieties of bacteria and 5,000 viruses every day. By using Germ Stopper Mats from Iris City Cleaners you will improve air quality in your facility by killing germs and preventing the bacteria that causes odors form spreading because the AEGIS Microbe Shied TM anti-microbial treatment is permanently bonded to each fiber of our mats, you can count on them to keep killing germs and bacteria for the life of your program. Also, eighty five percent of the water, dirt and dust in your place of business is tracked through the front door. Clean your air , in recent years research has discovered a new benefit of dust catching floor matting. Properly cleaned mats greatly reduce the sources of dust particles in a building and therefore an excellent tool for improving Indoor Air Quality. The world Health Organization estimates: that 30% of all buildings have poor Indoor Air Quality. which can cause flu-like symptoms, sore throats, eye irritation, and allergies. 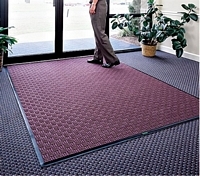 Properly placed mats help make your facility safe and sanitary. A clean environment is healthier and safer for your employees and better for your business. Professionally serviced floor mats can catch at least 70-80% of the dust, dirt and grime tracked into your facility. We are proud to present the Mountville Mills mat collection: Here are a few additional mats available from Iris City Cleaner's and Laundering Company. Motivational - Anti-drug, supermarket, holiday golf etc. Anti fatigue mats - Designed to reduce physical and emotional fatigue while standing for extended periods of time. Scraper mats - Keeping 45 to 60% of large abrasives out our your environment. All of the above are available for rental and for sales. Please explore the quality features of all of these products and particularly the one you are interested in at our link to www.mountville.com. We have a data base of over 50,000 custom made logo mats on our www.mountville.com link on search the databases for custom made mats. You may find something there or parts of something there which we can work into your design. There are no limits to the infinite number of possibilities we can create for you. More than 80% of the dust, dirt, and grime in pubic buildings is tracked in from outside. one square yard of commercial carpeting can accumulate one pound of dirt a week and up to two pounds during wet weather, The cost of removing one pound of dirt from a building can easily exceed $500. Only 10% of dirt is removed from floor mats with a vacuum cleaner. 96% of building maintenance cost is labor. How sick is your building? 1) an average establishment used 5 3x5 floor mats. (set). Dealers stated list price $100 each mat, plus tax and freight. 3) Allocations of replacements for loss, damage and normal wear out, Effective life of most purchased floor mats is 6 to 18 months. 5) Service charge for 5 mats changed weekly for 104 weeks (2 years) Compare the total floor mat purchase and maintenance cost to that of a professional service leads to one conclusion. Service absolutely costs less. Call today... you'll be glad you did.